Join SANDCASP now by filling in the form below! Regular Member: A credentialed School Psychologist and/or Licensed Educational Psychologist who is employed within the educational system in San Diego County, California. 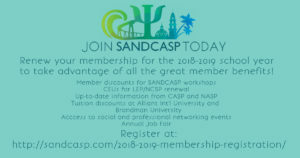 Associate Member: An educational professional who does not meet the eligibility requirements of any of the other membership category but has a strong affiliation to school psychology, supports the work of the profession, and wishes to convey that affiliation and support through membership in the association. Retired Member: A person retired from active employment in the educational system. Student Member: A student enrolled in a full-time School Psychology graduate program.